Grab your kids and prepare yourself for a wild ride, because our favorite characters from RIO are back and they're crazier than ever! Check out the brand new TRAILER for 20th Century Fox's upcoming animated comedy RIO 2—opening in theaters everywhere on April 11, 2014! If you loved the first film, you and your family will surely get a kick out of watching Blu, Jewel and their three kids navigate the wilds of the Amazon as they encounter a whole new slew of quirky characters. As Blu tries to fit in, he goes beak-to-beak with the vengeful Nigel, and meets the most fearsome adversary of all – his father-in-law. My kiddos loved the first one and are now pretty pumped for the return of the same characters! Get excited for this new movie this spring! The Synopsis says, "It’s a jungle out there for Blu, Jewel and their three kids in RIO 2, after they’re hurtled from that magical city to the wilds of the Amazon. As Blu tries to fit in, he goes beak-to-beak with the vengeful Nigel, and meets the most fearsome adversary of all – his father-in-law. All our favorite RIO characters are back, and they’re joined by Oscar® nominee Andy Garcia, Grammy® winner Bruno Mars, Tony® winner Kristin Chenoweth and Oscar/Emmy®/Tony winner Rita Moreno. 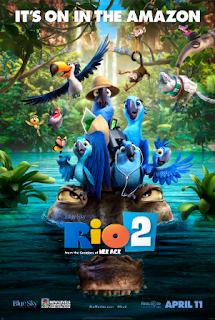 RIO 2 also features new Brazilian artists and original music by Janelle Monae and Wondaland."